Other Products by Body Science. Search other Weight Loss products. Bodyscience Hydroxyburn Clinical Tablets is a well-balanced formulation that contains herbal extracts and selected vitamins and minerals. It contains naturally sourced caffeine from Green Tea Leaf and Guarana Seed Extract. Apart from its Caffeine content, a well known natural metabolic enhancer, Green Tea also contains a polyphenol called Epigallocatechin-3-0-Gallate (EGCG), which has been demonstrated to increase the basal metabolic rate- the rate at which you burn calories1. If that’s not enough already, BSc Hydroxyburn Clinical also contains Melissa Officinalis, a powerful herb used to enhance cognitive function, support the nervous system—which let’s face it, can take a beating these days—and reduce anxiety2. Melissa Officinalis has a synergistic effect, when taken in combination with caffeine-containing herbs, such as Guarana, in minimising jitteriness, a scattered brain and the sensation of stress. Bodyscience Hydroxyburn Clinical contains a whopping 450mcg of Chromium per tablet, making it a powerful stand-alone Chromium supplement in its own right. 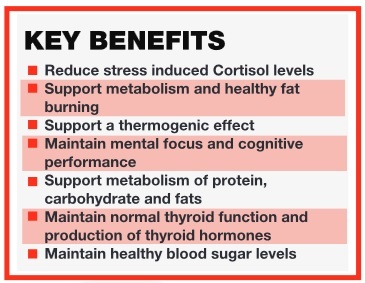 Chromium is a mineral that assists in reducing sugar cravings and helps to improve insulin sensitivity, making it easier to avoid sugar and calorie loaded foods so to help make fat burning a priority3. Insulin resistance is a condition linked to overweight and obesity, which prevents glucose from entering the cells at a normal rate, to be used for energy, and also prevents fat burning for energy. Targeting insulin resistance during weights loss programs will make it easier to get those blood sugar levels under control, so to assist with reducing elevated insulin levels (hyperinsulinemia) and access your fat stores for energy, which is certainly what we want! Additionally, BSc Hydroxyburn Clinical Tablets contain another mineral called iodine, which is essential for the manufacture of thyroid hormones T3 and T4, both of which set the metabolic rate or the rate at which we burn calories. T3 contains three atoms of iodine, while T4 contains four atoms of iodine. Iodine is therefore a structural component of the thyroid hormones, making it crucial for maintaining a healthy metabolic rate. Take two tablets each day, preferably before lunch, or as directed by your health care practitioner. It is not recommended that you exceed this dosage. Elite athletes, recreational trainers and sports enthusiasts; pre-competition bodybuilders; overweight and obesity; individuals under exam stress, such as university students; people having difficulty with concentration; anyone looking to reduce sugar cravings; people with slow or sluggish metabolisms.